Many students learn best by doing what they are learning about in school rather than watching someone else do it or reading about it. A CTE program will give you hands-on training with industry specific equipment so you can develop skills inside and outside the classroom, challenging you to grow and giving you the support you need to earn a certification that is recognized by employers in that industry. 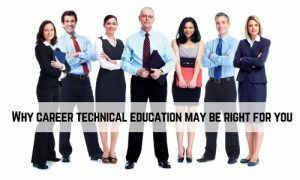 Is Career & Technical Education Right for You? When deciding if a CTE program is right for you, it is crucial to find a program that is not only challenging but well-supported. You will receive direct on-the-job training, which is important by giving you relevant skills and allowing you to practice real work outside the classroom. Under the supervision of job site coordinators, you will be able to learn from your mistakes and apply what you have learned to become successful in your career following graduation. The Jobs Partnerships offers the LifeWorks Training program to men and women who are unemployed, underemployed, or feel stuck in their job and want to explore better career opportunities. Through our partnerships with the Center for Accelerated Training at Valencia and Orange Technical College, we can help you discover the path to the job you were made for, and help get you connected to the right people and resources to make your goals a reality. Call us at 407-641-0755 or apply here and let us show you how LifeWorks classes help build career pathways to a better life.